After destroying the winter food supply for the rest of the animals, mischievous squirrel Surly (Will Arnett) is banished from the park into the city by Raccoon (Liam Neeson). 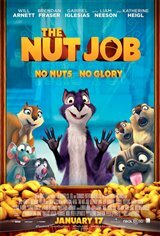 Surly must team up with his rat friend Buddy to break into the nut store to help redeem himself and ensure the survival of the park community. When things go wrong, Surly finds himself in an outrageously complicated adventure that requires him to enlist the park inhabitants to make sure they have food before winter hits.